Ladies (and some gentlemen,) but, ladies it is start of what we have all been waiting for! The beginning of the crowning of the Miss America Class of 2019!!!!!!!!! I wanted to do 50+ exclamation points, but I thought that might be weird. It is happening! This might be the last weekend of the summer without a crowning! I don't know! Literally! Because I don't check the schedule! But here it is. The locals are done. The paperwork is in. The last of the CMNH dollars are being raised, the ads being sold, the stones being sewed (glued?) Probably, glue them, but like, don't trust me on that one. As we watch our ever-beloved 2018 class begin to pass on their crowns, and make our brackets for each (lol) state pageant of 2019...there are more than one thousand women, just waiting to see if this is the year that their dream comes true. There are at least one thousand, four hundred and forty seven girls going for a state title this year. And uh, not to brag, but I did do that math. That means they won a local, they prepped a talent, they have the dress of their dreams, and they have put their heart and souls into working for that state crown. And only 51 of them will walk away with that dream this year. 3.52% of the girls will make it to the Miss America stage. Talk about putting some big things in perspective. How do you go through building this foundation for your dream? How do you manage to keep the focus when you know that there are so many other women that feel this pull just as strongly as you, right? Because that has got to be the goal: build the dream, keep the focus. And it can be so hard to stay in your own lane, run your own race, and be your own person - when you are literally competing for your dream job against other wildly talented, intelligent, gifted, kind, and beautiful women. Literally, I know. I've been there. And I know that hearing from someone that made it off the state stage with a crown may not be what you need right now. Because I can tell you how I did it. How I figured out how to stay in my own lane, and run my own race. And I can tell you how I made the choice to keep coming back to that stage in the name of my dream. But you know how that story ends for me. "I was devastated at first, because I felt like I had so many ideas regarding sponsorship, recruitment efforts, fundraising and ways that I could make a difference with the crown. But I look at what I did accomplish with a local crown and I reflected on what I accomplished at the state pageant - swimsuit preliminary winner, a very special humanitarian award, and a boatload of scholarship money and I realized that I didn't actually walk away a loser, I just walked away a winner in a different way. And now that I've been out of the program for quite some time, I realize there was a different plan for me. If I had won, I probably wouldn't be in the job I am in, at a company that I love, and I probably would have planned the wedding of my dreams. I think it's all about timing and appreciating the card that you were dealt. And if you don't like said cards, figure out a way to make lemons out of lemonade!" Guys, this! Looking towards the future after a loss is hard, especially when the future you've been planning for, cannot be your reality. But being able to consider what you did to get there and how that carried you through your competition, and on to the future that follows is what is going to allow you to move on to those big amazing things that are to come. "Watching all you worked for slip away is undoubtedly one of the most difficult moments one can go through. It was time and money and energy and sacrifices that seemed to be all worth nothing, and it was a feeling of such worthlessness. But only for one second. Because then I realized I was blessed enough to be privy to my sweet friend realizing her dream. And that was so much cooler than all the crappy feeling I was feeling. I mean, I still cried. But there was such a feeling of peace and joy. And I may or may not be taking time off. Or may just be celebrating myself and the rest of life. But everything I've learned through pageants has given me the skills I need to succeed. I can use a microphone and navigate a room. I can speak to all age groups and motivate crowds. I can ask people for donations and organize events. I can be the leader and the follower. I can interview. I can dress well. I am more than my one experience because of the many experiences it took me to get there. Sometimes it still hurts looking back because it brings back feelings of inadequacy, but my life has been so much bigger than that." You won't want to hear it, and it may even take time to believe it, but life goes on. 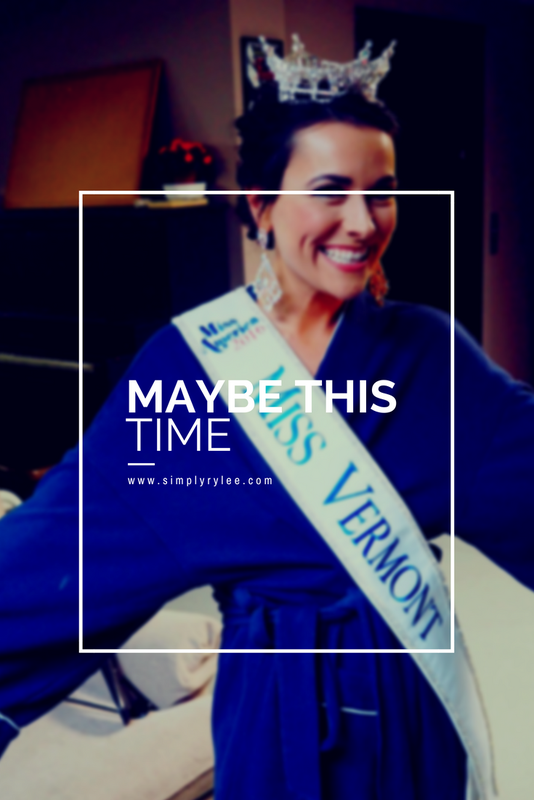 Even know, my life doesn't really include the fact that I was Miss Vermont. Sure, it's something that I did. And for one year of my life it was everything that I did. But now? I'm more than a title. I'm more than a job. I'm more than my short time on stage. And that is true, win or lose. Because it is what you get from the program, and from the experience, and from the people that matters. The crown is nice. We know. But the value isn't in the crown. "I knew that there had to be a reason. I knew that there had to be something coming for me that year that wasn't a crown. And it turns out - even three years later - that not winning that year was the single best thing that could have happened. I couldn't see it then or for a few weeks afterwards but within a few months I was sure, it was the best thing. Honestly. I got lost after...I lost. I was sure the judges were wrong, and that it had to be a mistake. I knew I wanted it so much. I knew I wanted to have that job. But I didn't get how they missed that. I didn't want to wait to find that next thing or whatever God had put on my path. I just wanted to win. And it took a while to see how clearly important it was for me to not win to get to where I am today." I can't say it's going to make sense. I can't say it's going to feel right. But I can say what I've heard a hundred times, and what I've said a thousand times more: not now, doesn't mean not ever. If you scroll up you'll see many times in my life I've been on the same stage as multiple Miss States. As we like to say up north, there are many Miss Vermonts in this room. And sometimes it takes five years, or ten, or just one shot. And sometimes you go through this process and you only gain confidence, sisters, knowledge, self-worth, and scholarship dollars. I know this journey is hard, but that is exactly what makes it so worth it.